Which can be used to analyse the data captured during individual sessions. Just download and run the installer exe file. .Net 4.6 required. Automobilista - Requires the rFactorSharedMemoryMapPlugin (https://github.com/dallongo/rFactorSharedMemoryMap). Can be autoinstalled by the app. This is the same plugin that is used (and automatically installed) by CrewChief, so if you're using that, you're good to go. 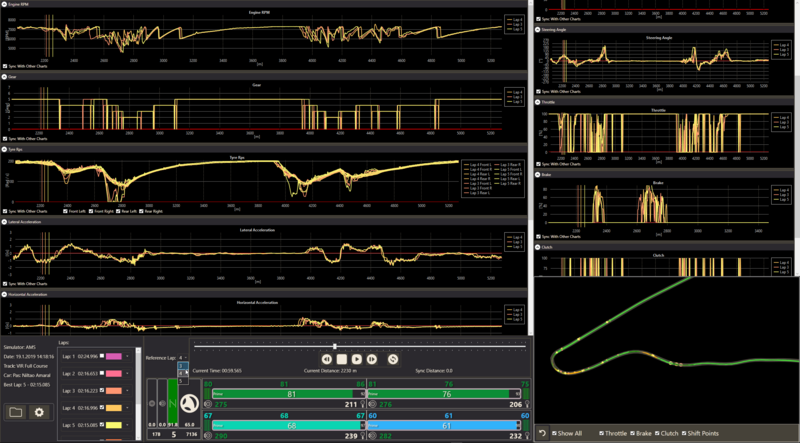 RFactor 2 - Requires the rF2SharedMemoryMapPlugin (https://github.com/TheIronWolfModding/rF2SharedMemoryMapPlugin). Can be autoinstalled by the app. This is the same plugin that is used (and automatically installed) by CrewChief, so if you're using that, you're good to go. Assetto Corsa - Requires custom plugin, than should be automatically installed when the app detect Assetto Corsa running. The plugin needs to be enabled in the options settings manualy. AC doesn't provide temperature information for water and oil temps, so these will be frozen. Because AC splits are little bit weird (i.e. track have 15 splits), the app is using custom splits. Each split is 1/3 of track distance. If you restart session soon after start, then the app might not re-initialize property and reset the timing after the first lap is completed. Tyre wear might not work correctly. Rework of the timing circle, so the app can learn track layout so proper map can be displayed. First version of application made public. I change the color scheme a little, but, sadly, I'm your typical developer lacking aesthetic feel, so it clearly can be improved. In future all colors will be a setting option. Hopefully you can read that; I tried to download the program and this is the error that I get. I've got net 4.6 or greater installed. Damn, will take a look the moment I get back from work. Edit: What OS do you have? Edit2: Check this workaround https://stackoverflow.com/questions/15238714/net-local-assembly-load-failed-with-cas-policy and see if it works. OS is win 8.1...ok ill try the workaround later today . I've uploaded v0.0.2, please, try it out if it fixes the problem. Awesome , I downloaded it and it fixed the problem, I didn't run it in a race but all looks good. Hi I really find this app useful , though one issue I have is that it works fine in single player but when using in multi it works in practice and qual (although it resets laptimes alot)but when a race starts the app closes. Is there anything in settings to allow for sector times ? Sadly, I haven't had time to test the app in MP (as I'm a SP player), but I will look at those issues and will try to solve them, hopefully soon. Added initial project cars support - big thanks mr_belowski for allowing me to use his pit coordinates for pit entry/exit detection. Project cars 2 should work with Pcars1 shared data model, but as Pcars 2 doesn't work on my pc (I'm affected by this bug - http://forum.projectcarsgame.com/sh...e-GTX770-Crashes-every-time-amp-or-reboots-pc) I won't be able to support pcars 2 atm. Fixed lots of issues in MP (timing resseting, no driver list, no player detection...). I completed several races in MP without any issues, so I hope all those major MP gremlins are fixed. Hi. I had the app crash again after a multi race at birds. I downloaded the update however I'm not sure if it's the correct version installed.. I didn't delete/uninstall original (didn't find it under the list of programs in control panel) ..will the new version overwrite ? Thant's a good suggestion, it will be in next version. I'm also working on logging and a normal installer, which should also be in the next version. Hi. Great news. Not knowing much about these apps but is it possible to have the app run by the cpu rather than the gpu. I suspect when I have alot of apps running for the game I lose framerates. I cannot affect where the app is rendered, but I'm working on making it a little more optimized (well, I hope it will be a little bit more optimized ), as some of the things right now as not done in the nicest way. Hi . I can't get this to download. I get an error message saying it can't load and to try signing on as administrator... I'm already the admin. Lol. Hope ya have time to look at. Damn, that's an oversight on side, sadly the installer is currently not smart enough to actualy ask for the elevated privileges to access the program files folder. So the easiest workaround is just to install to another folder outside program files. Or to run it with admin privileges. Sorry for the inconvenience I will try to fix it tomorrow. The biggest change is total rework of user settings, which got their dedicated settings windows. Settings are now also stored between sessions. 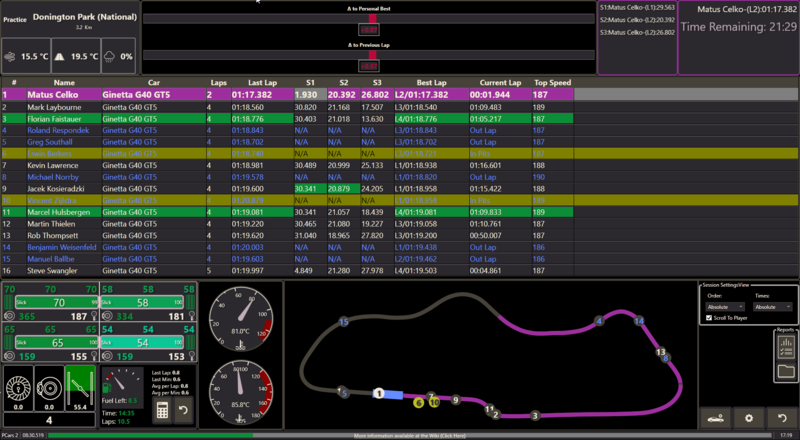 In addition to selecting the drivers order / times mode for each session, it is now also possible to enable/disable individual rows in the datagrid for each session type + size changes to these rows are now also stored. So, with the ability to hide/show individual row I can now add more information (i.e. split times) withour overcluttering the grid.